It Is the twenty-seoond century...and the dawn of mankind's boldest adventure. Thanks to the amazing breakthroughs in warp technology, an era of true Interstellar exploration is about to begin, and a whole new universe, full of astounding wonders and unparalleled dangers, has just opened up for humanity. Someone has to lead the way, and that someone is Capt. Jonathan Archer of the first Starship Enterprise, NX-01. Archer and his crew, including Vulcan SubCommander T'Pol and the enigmatic Dr. Phlox, will face challenges previously unimagined as they truly go where no man has gone before. But they must also survive first contact with a fearsome extraterrestrial race known only as the Klingons. The thrilling premier of an all-new Star Trek® saga. Plus, as a special bonus, a 32-page look behind the scenes of the hit TV series! Failed! I have smashed my craft, and now I flee to live! Die here? In rows of weeds and seeds? This is no way to die! Suliban! The savage pawns must not have what I know. Escape is not cowardice! Run! Thus he ran from the smelling wreck of a noble craft that had carried him so far, whose flawed intakes he had not been able to mend in time. The wreck would distract them. 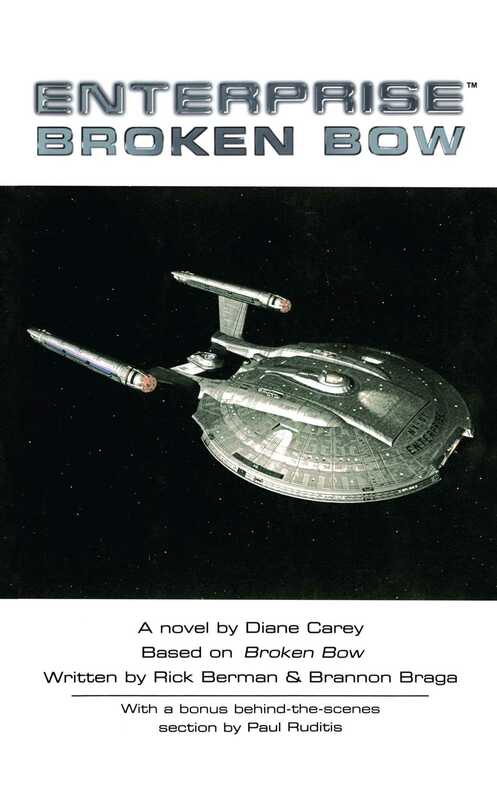 It was Klingon to its core and it would serve till the end, spewing a curtain of smoke to hide him in the stalks. Who was on this planet? Who had made the stalks into rows as tidy as a mOghklyk's spine plait? What beasts were here who built the land into squares, the buildings into squares, and the fences into squares? Were they also square? Klaang ran, ran like a fear-driven child, but with anger also, which kept him leaping harder with each step. The gravity here -- he could run faster than on Qo'noS. His bulky body served better here and seemed young again. He knew he was big, even for a Klingon, but here he sensed an advantage. Suliban animals would lose him in this weed field. Then the blasts began, and he knew he was wrong. The stalks beside him burst into flame and withered, blackened. A glance over his shoulder told him they were after him even through the smoke and weeds. He saw their mottled faces, heard their weapons, and sensed their insult. "Hah!" A burst of new energy, driven by the stink of burning plants, drove him faster toward the square buildings he had seen as his craft rushed overhead to its death. A good death in battle for a good old craft, to go ferociously into the dust and flame with scars of Suliban attack. The future would know about it. The Suliban weapons spat bitter fire at Klaang as he ran. The alien countryside lit up in great expanses. Ridiculously, he tilted toward each shot; escape would be preferred, but if there was no escape, he wanted to die boldly. He was running to save the mission, after all, not himself. His conscience and his duty were in conflict. But to die with Suliban disruption in the back -- who would tell how it really had been for him? Why he died with wounds in his back? He was about to try when a port opened in the nearest building and an alien emerged, bright in the face and round in the body, with hairless chin and narrow shoulders and cloth on its head. Shock broke across its expression, and it disappeared back into the swinging port. Klaang angled away from that building and went for the silver tower to the side. It was windowless and tall, suggesting an inner confusion and a possibility of darkness in which to conceal himself. The door was large enough for him, made of thin metal and bracings. He pushed it shut and slammed the rod that obviously bolted the door. Would Suliban be stopped? Klaang stepped back into the darkness and looked at the door. A thin sliver of light around the perimeter proved the door was not tight. Suliban would flatten through it. He had seen the disgusting sight before. He began to feel his way around, and found a ladder. By the time he heard the Suliban dislocating their skeletal structure to melt under the door -- actually, he heard their shuffles as they reassembled, but in his mind he saw the meltdown -- he was bursting out another door, high in the silver tower. Another roof! Yes, he had seen this nearby small building, and now it was here to help him! He held his breath, and leaped. His soles slammed onto the tiny roof, breaking the plated material that warded off weather. In his mind, he endured a quick guess about what kind of weather would come to a place like this. Then he was on the ground again. He lost balance for a moment as he spun around and drew his disruptor. Now! He would get a shot at them! They were inside that port he had just come from, trapped in the metal tower! A disruptor shot would charge those metal walls and force the Suliban out the other end, where Klaang would be waiting for them! He leveled his disruptor and fired a single salvo at the open portal he had just come from. Rather than a simple charge, what came out was a gout of sheer fireball. The tower rumbled at its base, then blew to splinters with a great throbbing roar. Explosives! Why would these aliens keep volatiles in a field of stalks? Klaang staggered, shocked, blown backward by the unexpected detonation. He stared at the instantly burning wreckage and wondered why a simple tower would get a noble death, just for hiding volatiles. But the Suliban would have no more interest in him. Not those two Suliban. Momentarily confused, Klaang stumbled and turned to see the slope-shouldered alien now standing two steps from him, with a weapon aimed at Klaang's breastplate. Klaang tried to make sense of the sounds, which seemed to have some Klingon inflections, but he made much more of the stance. "Rognuh pagh goH! Mang juH!" Would the alien understand his warning? The alien's face crinkled. "May'v nodea mityer sning, muttay gerrentee i nowow tuze iss!" Why had this creature interfered in the quarrel of others? What kind of people were these? In a rage of insult and irritation, Klaang slapped his thighs and ranted, "HIch ghaH! Oagh DoO!" He was about to spit out his further opinion, when the alien proved him completely wrong by opening fire. An energy stream bolted from the weapon and caught Klaang in the chest. As he sailed through the light and bright air to the place where he would die in the stalks, he silently thanked the interesting alien for a wound in front. At least future ages would know he hadn't died running. Copyright &copy; 2001 by Paramount Pictures. All Rights Reserved.